IBA Centre for Excellence in Islamic Finance (IBA-CEIF) is off¬ering a two month weekend refresher course for "Certified Islamic Professional Accountant" (CIPA) in collaboration with Accounting and Auditing Organisation for Islamic Financial Institutions (AAOIFI), Bahrain. The course will cover the Auditing and Accounting section of the CIPA program. The course will be conducted by experts from AAOIFI and industry. 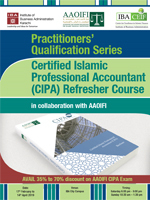 The participants of the course will be eligible for discounts on the CIPA Exam conducted by AAOIFI.